First seen in the US in September 2014 at Samsung's Dallas dealer show, the MX-7's arrival on the market will be a big step for Samsung. 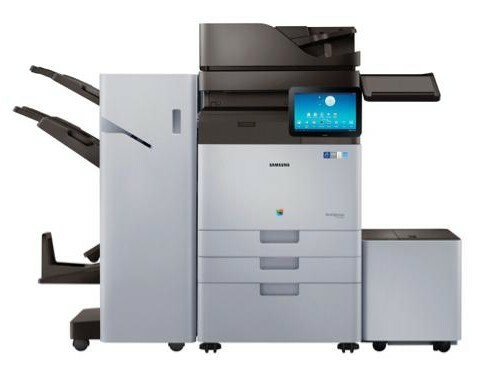 Although Samsung have been manufacturing and marketing A4 machines for years, they only brought their first A3 copier to market in 2010. With the MX-7, Samsung will arrive at the high end of the color office market - and it will have specs to match this ambition. Running at 60 ppm onto A4, it will have a QuadCore processor and 6 GB of RAM making it one of the most powerful machines on the market. The touch-screen interface is perhaps the biggest head turner. Already seen on Samsung's A4 machines launched in 2014, the 10.1 inch runs Android. This will help with the integration of business apps, and with printing documents right from the machine's control panel. Samsung presented the machine at the EU Forum 2015, their annual event, which was held in Monaco last week. We're expecting a full launch in May or June.